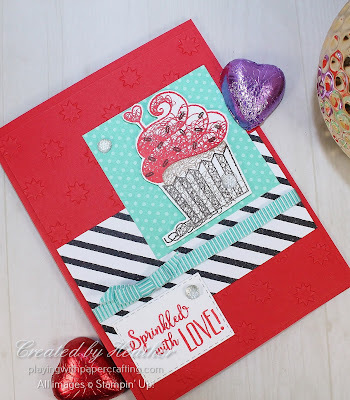 One of my favourite types of stamping challenges are collection or assortment challenges, where you are given an assortment of different elements and you have to include all of them in your card design. It's challenging but fun and so much fun to see what everyone comes up with, because they are always so different in spite of having to use the same elements. I just love the rich, yet bright red of Poppy Parade. It's such a satisfying colour for some reason. 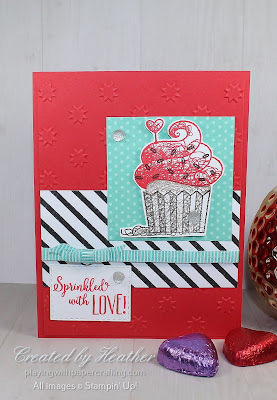 I used it for the card base and for the next layer which I embossed using the Oh My Stars embossing folder. 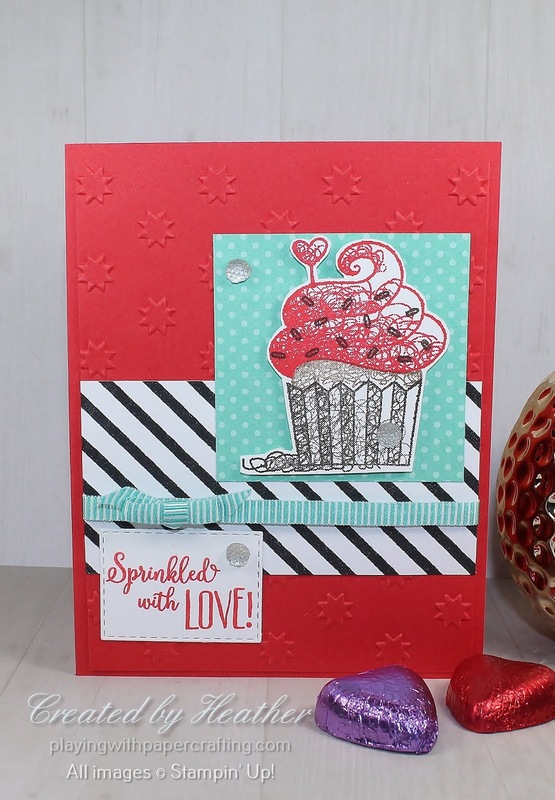 The stripes element are from the Botanical Butterfly Designer Series Paper, which, like the Hello Cupcake stamp set, is a Sale-A-Bration reward. The Designer paper behind the cupcake is in Coastal Cabana and is from the How Sweet It Is Designer Series Paper. The cupcake is stamped in 5 steps including the sprinkles and the little heart. The best way to do this is to set it all up on the Stamparatus. The cupcake paper and the sprinkles are in Early Espresso. The cupcake sliver you can actually see is in Soft Suede ink. The icing and the little heart are Poppy Parade ink. Once stamped, the cupcake is fussy cut out as per one of the elements of the Collection. 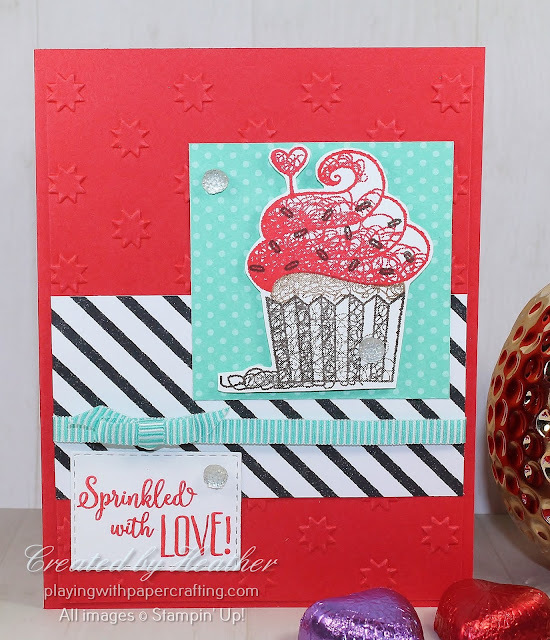 It's added to the card with Stampin' Dimensionals. The ribbon is Mini Striped Ribbon in Bermuda Bay, which is not far off the Coastal Cabana in the paper. 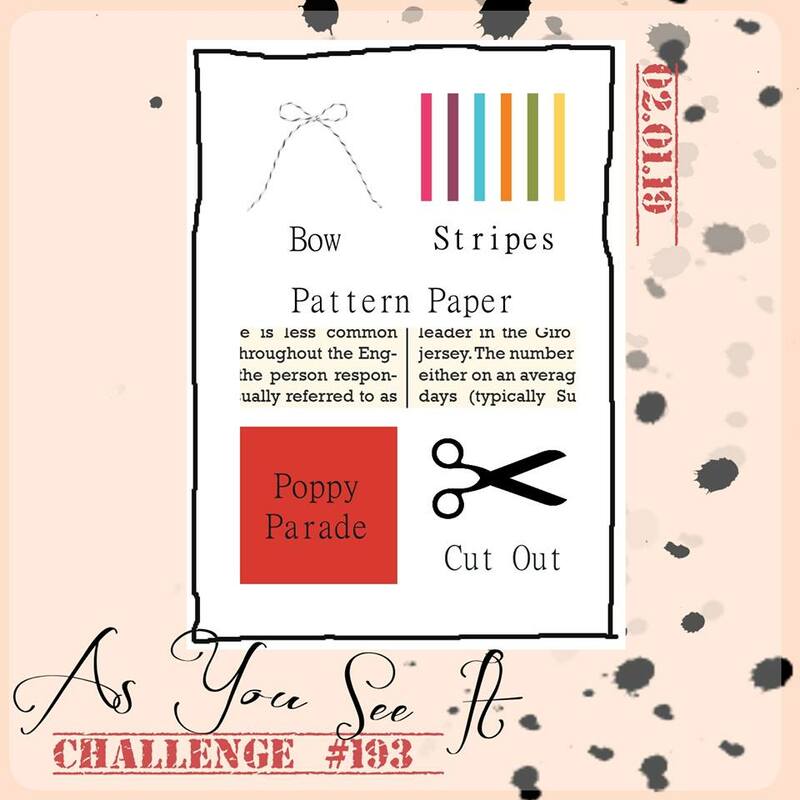 The bow fills one of the criteria of the challenge and it's a little fork bow, added using a glue dot. The sentiment is also from the Hello Cupcake stamp set, stamped in Poppy Parade and die cut using the Rectangle Stitched Framelits. The embellishments are Clear Faceted Gems. 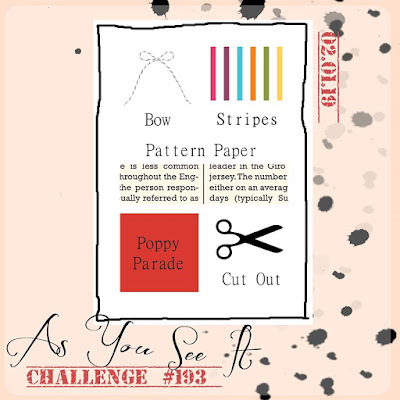 Why don't you give our Collection Challenge a try here? Have some fun with it! Have a great weekend and keep warm out there in the Polar Vortex!! Snuggle up in your craft room and create!